The PROTEUS™ CRP150 is a robust, lightweight and extremely powerful 6 wheel drive, steerable crawler, and offers everything needed for professional pipeline inspection. 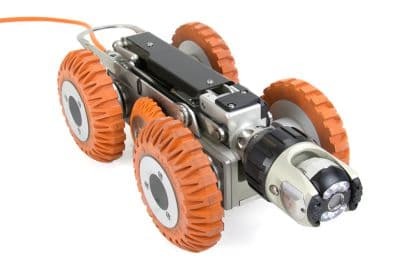 Designed and developed in-house, Mini-Cam’s PROTEUS™ CRP150 crawler is part of an entry-level modular system for the pipeline inspection market, and can be installed as part of our Custom Vehicle Fit Out service (UK only), or be fully portable with the PROTEUS™ Trolley and Battery components, giving up to 5 hours of inspection in a highly compact solution. 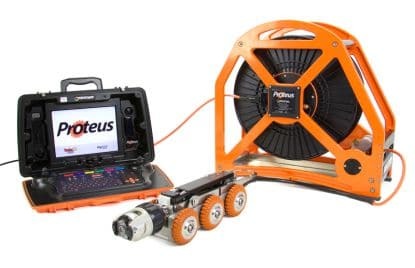 All our PROTEUS™ crawlers feature CAN bus technology, allowing communication directly between each piece of attached equipment, and can relay control and status information such as activity, speed, pressure, inclination and temperature. 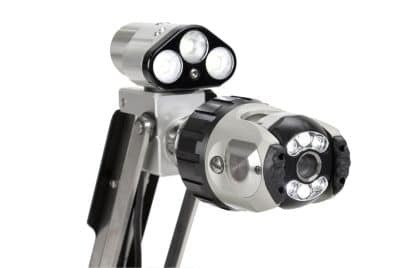 The in-built elevator device allows for quick and easy centring of the camera in pipe sizes up to 600mm. Both cameras have extremely powerful LED lights. Choose from our axial camera or the pan and rotate with full 360° rotation. 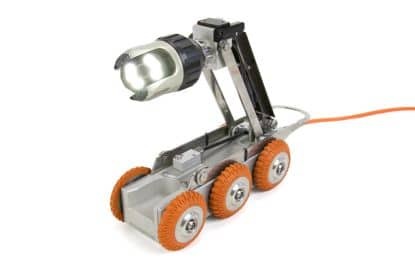 The auxiliary light features a colour rear view camera to aid crawler reversing. Designed and developed exclusively by Mini-Cam, our patent pending wheel lock device makes changing wheels quick and easy. 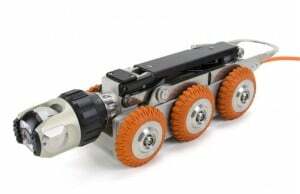 4 different size wheel options allow the crawler to be centred in pipe sizes from 150mm to 600mm. For fast and easy deployment and retrieval. 33Khz, 512hz or 640hz. The frequency can be selected in the control unit menu. The inclination sensor has 2 purposes. The lateral axis is used to detect the crawler roll angle and an audible and visual warning is given by the control unit to inform the operator that the crawler maybe in danger of tipping over. The longitudinal axis is used to determine pipe inclination which can be recorded as part of the survey. The robust and extremely rugged heavy-duty connector features our patent pending lock system which requires no tools to connect and disconnect. Today you can access an impressive range of highly innovative components and accessories making PROTEUS™ one of the most versatile and capable systems available. In the future there will be even more options as we continue to innovate the best solutions for your needs, and always with our best ideas, engineering and creativity.